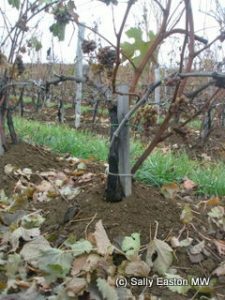 Not some ancient rite of passage for dead vines but a way to keep vines alive during the -26 to -27°C winter temperatures experienced around Rostov-on-Don. 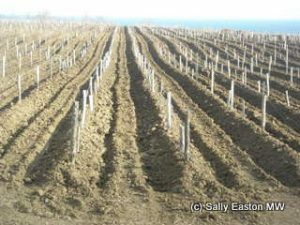 It is not really practised in, frankly quite balmy by comparison, vineyards near the Black Sea, though this pic shows the trunks slightly mounded at Lefkadia, in the Black Sea region of Krasnodar. In January 2012, temperature did get down to -27°C in Krasnodar, which was not a typical winter. 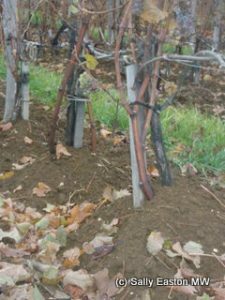 They lost about a third of the crop, but didn’t lose vines, which recovered. The pic shows dead wood killed by the freeze, plus new season growth that formed from the base of the trunk. Further north in Rostov-on-Don, some eight hours fast road-trip driving, vine burial is an annual event. Hardy hybrids are left to their own devices, they get to face the winter. 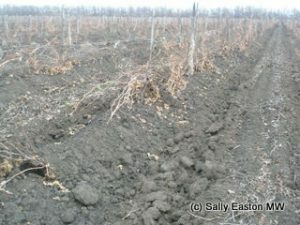 Weedy western varieties are fully buried, as at Tsymliansky Wines. 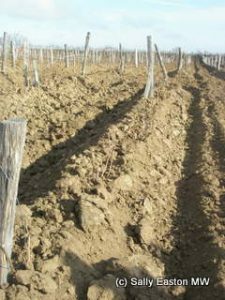 Hardy, adapted, indigenous vinifera such as krasnostop, which has thick wood, is buried a bit, but, for example, the folk at Vedernikov were unperturbed that the annual canes were exposed. It’s important to protect the permanent wood. The vine covering is complete by mid November. A blowing machine uncovers them the next March. My visit to Russia was sponsored by the Union of the Oenologists and Winemakers of Russia.